A printable version of the newsletter is available here, along with the January and February calendars. As many of you know, I embark on a ten-day “Familiarization Pilgrimage to the Holy Land” next week. The trip will be led by three Episcopal clergy: Dominique Barrington, the Dean of St. James Cathedral in Chicago; Bishop Barry Beisner of the Diocese of Northern California; and our own Bishop Greg Rickel. While the blessing of traveling for the first time to the Near East—visiting places where Jesus may have lived and taught and healed—excites and quickens my imagination, I must say that it is the idea of undertaking a pilgrimage which most affects me. From the dawn of Christianity, seekers have traveled to holy places as a spiritual practice. Our modern-day celebrations of Holy Week came to us via the travel journals of a fourth-century nun who made her pilgrimage to Jerusalem! For centuries, Catholics have made pilgrimage to various churches around Europe; those in Latin America may travel many miles as pilgrims to a shrine for Our Lady. For our brothers and sisters who practice Islam, a pilgrimage to Mecca is a foundational aspect of their faith. I wondered: what makes someone a “pilgrim”? Common aspects of a pilgrimage—whether in the Middle Ages or today, Christian or Buddhist or Muslim—include journeying far from the comforts of home. From what I’ve seen of our three hotels: Der Pilgerhaus Tabgha (where I can practice my German! 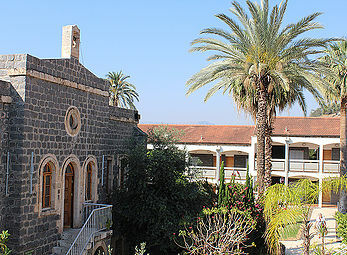 ), The Orient Palace Casa Nova in Manger Square of Bethlehem (will there be room? 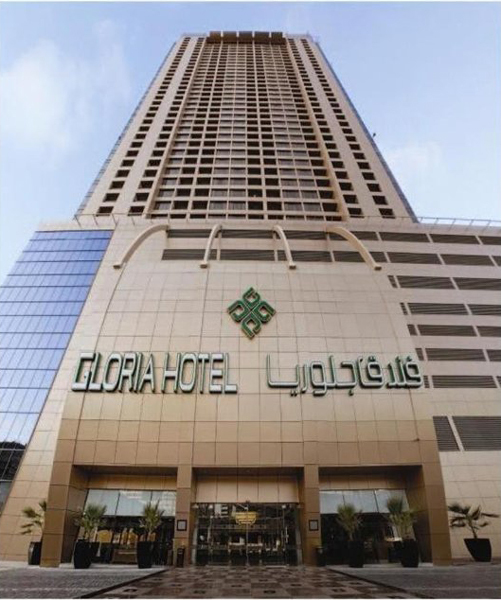 ), and the Gloria Hotel in the Christian Quarter of the Old City of Jerusalem—we won’t be giving up too much in the way of comfort. Pilgrims also typically endure the rigors of long treks, and carry little with them other than a deep, inner purpose. What purpose will I take with me, along with my plug adapter and my passport and books? I’m reading a book by noted theologian and Biblical scholar Walter Brueggemann entitled, Chosen? Reading the Bible Amid the Israeli-Palestinian Conflict (Westminster John Knox Press: 2015), as well as Sonia Weaver’s What is Palestine-Israel? Answers to Common Questions (Herald Press: 2007). I’m very much aware that we travel to this Holy Land at a complex time, and I appreciate Brueggeman’s sharing the Hebrew understanding of the land and people as a unified entity, and I share his hope for their wellbeing. Blessed are you, pilgrims, if you find that the Camino opens your eyes to the unseen. Blessed are you, pilgrims, if what concerns you most is not arriving, but arriving with others. Blessed are you, pilgrims, when you contemplate the sights of the Camino and find them full of names and new dawns. Blessed are you, pilgrims, because you have discovered that the true Camino begins at the end. Blessed are you, pilgrims, if your backpack empties of things as your heart doesn’t know where to fit so many emotions. Blessed are you, pilgrims, if you discover that a step backwards to help another is more valuable than one hundred forward without awareness of those at your sides. My brothers and sisters in Christ, please join me in praying not only for myself, but for my fellow pilgrims on this journey. Pray that what I discover in myself I may bring home to you, my congregation, for our mutual well being. 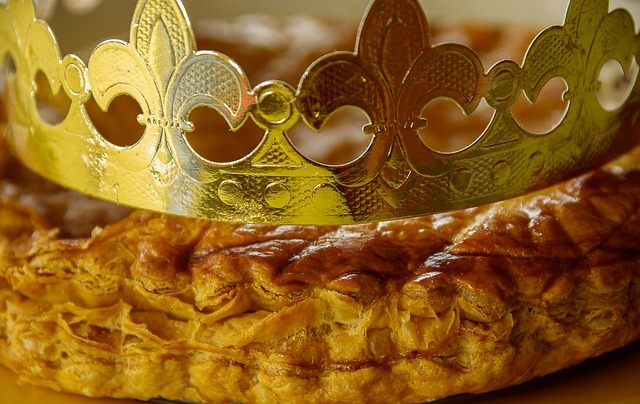 This Friday, January 6, marks the Feast of the Epiphany, also known as Three Kings Day or Twelfth Night. Epiphany celebrates the revelation of God in his son, Jesus Christ—the word itself, “Epiphany,” coming from the Greek word for manifestation. Epiphany’s other name, Three Kings Day, references another key part of this celebration: the Magi’s visit to the baby Jesus. As for the third name, “Twelfth Night,” Epiphany concludes the Twelve Days of Christmas. The first was called Melchior. He was an old man, with white hair and a long beard; he offered gold to the Lord as to his King. The second, Gaspar by name, young, beardless, of ruddy hue, offered to Jesus his gift of incense, the homage due to Divinity. The third, of black complexion, with heavy beard, was middle-aged and called Balthasar. The myrrh he held in his hand prefigured the death of the son of Man. These Magi had been promoted to kings by the end of the fifth century. Biblical commentators linked the Magi to Old Testament prophesies such as Isaiah 60:3, Psalm 68:29, and Psalm 72:10, which read, “Yea, all kings shall fall down before him: all nations serve him.” Those commentators turned the Magi into kings to improve these prophecies, and more than a millennia later, the “king’s cake” emerged as a new Epiphany tradition. A king’s cake is made from sweet brioche dough, with a small baby Jesus figurine baked inside. Whoever finds the baby Jesus in his or her piece of cake is supposed to bake next year’s king’s cake. Epiphany was once celebrated as much as Christmas Day, although since the 19th century, it has lost much of its cultural prominence. The Episcopal Church continues to honor this feast day, however, as well as the following Sunday. The Sunday after Epiphany celebrates the manifestation of God via Jesus’ baptism in the River Jordan. We refer to this Sunday as “the Baptism of Our Lord. Greetings, and Happy New Year! I want remind everyone that our all-parish annual meeting and potluck brunch is coming up soon. 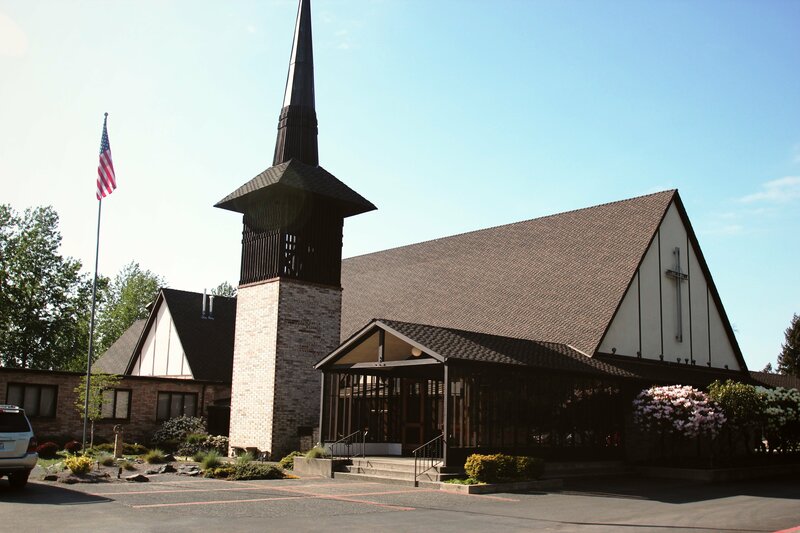 We will have one service in the morning at 9:30 a.m. on January 29, followed by the annual meeting downstairs in the parish hall. (Please note also that there will be no evening service that day.) I hope you will all be able to attend, as we review our budget for the coming year and elect delegates and alternates to Diocesan convention to replace those that have served their terms. We will also welcome our incoming vestry members elected last September, and we will thank our outgoing vestry for their service, as they finish their terms on that day. It’s a great time to gather and celebrate who we are together, while looking ahead to the coming year. Please join us. I promise to keep the meeting crisp, so that we can enjoy one other in fellowship and conversation. We are co-sponsoring a blood drive at LDS Kent on Friday, January 13 from noon to 6 p.m. (closed from 2 p.m. to 3 p.m.). Please sign up here. Who is your donation helping? Local patients need blood transfusions for many reasons like cancer, chronic illnesses, blood disorders and surgeries. One thing they don’t have to worry about when they are facing a health challenge is blood being available because of donors like you. A total of 30 million blood components are transfused each year in the U.S. Yes, you CAN donate if you’ve had a tattoo in the past 12 months – as long as it was performed in a licensed facility in Washington, Idaho, Oregon, or California. Find answers to other questions about blood donation. See the difference the gift of blood makes for local patients. Look up basic eligibility info. 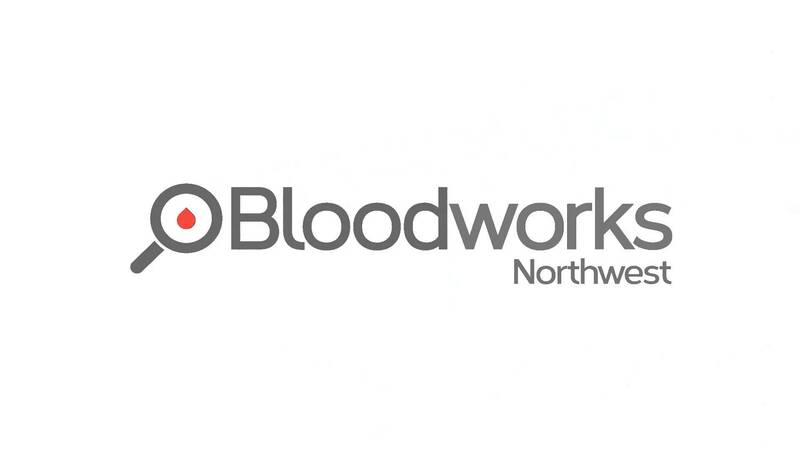 Thank you for partnering with Bloodworks Northwest in our pursuit of saving lives! Please sign up here. For Kids: Toys and games, bikes, tricycles etc. The newsletter is sent on Thursday of the first and third full weeks of the month. Submissions must be sent to info@stjameskent.org by noon of the Tuesday before. Copyright © 2017 St. James Episcopal Parish, All rights reserved.